It is very easy for some to give up and say, 'that's it! no more!' when things are not going the way that they had anticipated. That is understandable, because not everyone can stand up to the test in times of adversity. Some persons tend to shrink back, to withdraw him/herself from among others, while they try to deal with the situation on their own. When faced with adversity, you are thrown into a valley. It gets very dark and cold in a place such as that. You go through varying emotions. You are tempted to throw in the towel and surrender to defeat. 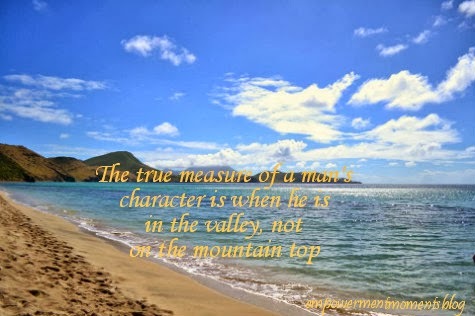 But the ultimate measure of a man's character is not when he/she is on the mountain top, but when they are in the valley. It may be easier said than done, but never despise your valley moments. Valleys are meant to shed un-neccesary loads, to rest, to replenish and rejuvinate one's inner being. Valleys are meant to strengthen you, to help you to glow so that you can begin to grow into your true character. Valleys have a start time, and likewise, they have a time of expiration. Valleys are where your giants, who previously tried to enslave your mind, come to die. God never intended for your valley to destroy you. The evidence of that promise can be found in scripture in Psalm 23:4 that says, "Yea, though I walk through the valley of the shadow of death, I will fear no evil: for thou art with me; thy rod and thy staff they comfort me." God's grace will bring you through any storm of adversity. If it is not like that which has been promised to you, then, it is not the end! The valley of adversity is meant to make you successful. For Jeremiah 29:11 says, "For I know the thoughts that I think toward you, saith the Lord, thoughts of peace, and not of evil, to give you an expected end." When you come through the valley of adversity, you can be sure of one thing, you will not be the same person like when you first entered into it. You will be better. You will be different. And looking back, you will be thanking God that He brought you through. Great post! Truly amazing stuff Yvonne! I have to say that I agree with this 100 no 1000%!! It is in the valley where we see the true test of a character. The well being of a person, and who they really are. Quote from Maya Angelou was perfect, these valleys are necessary for us, for our growth. Thanks Kalley. So glad you love this article. I got the inspiration to write it as I sat in with someone very close to me at her business place yesterday. She was having such a difficult day dealing with so many different things. But I am happy to say, it is so much better today. The storm clouds are just about gone. God bless you as always. Another home run on this post EMB!! Love it. Great source of encouragment and empowerment! Your valley is a place where ones' imperfections and weaknesses can also be surrendered to God while his/her character is defined. Blessings Janelle. Glad the post was helpful to you.